Like many people, I’m a diehard fan of SF films. I anticipate each new one with high expectations. In fact, if I had a superpower, it would be my suspension of disbelief. Unfortunately, reality dictates that many attempts to bring science fiction stories to life on the big screen (or DVD, as the case may be) result in either campy B movies, mixed quality films, watered down “event” extravaganzas, or a cesspool of bad acting, wooden dialogue, and special effects so cheap it seemed like the producers ordered them from the back of a cereal box. I realize that the road to creating a science fiction film is fraught with peril. F/X technology has limited countless projects since 1902's LA VOYAGE DANS LA LUNE. As with the Melies classic however, we can overlook this if the basic story is sound. Then there’s the budget allotted. Too little and irreplaceable elements end up on the cutting room floor. Production design, costumes, and cinematography all require synchronization in just the right way. To me, there’s also an unspoken factor, that of the cast and crew taking a science fiction film project seriously, and not merely jumping on the SF bandwagon to cash in on the STAR WARS & STAR TREK phenomena. For those reasons, I usually evaluate the quality of an SF film two different ways: The final product as is and what it could have been. There are so many elements involved that I count my lucky stars when a film succeeds with at least a few of them. So when a science fiction film, let alone one with a romance, achieves something close to perfection, I swoon. DARK CITY (1998) is one such film. In DARK CITY, our hero must overcome amnesia to understand his bizarre new powers and overthrow a sect known only as The Strangers. It doesn’t make reconciliation with his wife—if she ever was his wife in this topsy-turvy world—any easier, especially when he’s wanted for murder. I actually wrote the above words for another post—John and Emma were contenders for my “The Top 15 Couples In Science Fiction (Romance)”—until I realized that this couple and the film itself begged for a showcase of its own. Director Alex Proyas produced and co-wrote this spectacular journey that combines elements of film noir, romance, and mystery. It’s also a psychological thriller that paints Psi powers with a fresh coat of German Expression. Despite the twist ending, you’ll want to relive the film again and again. The romance is mature, yet understated and sweet. No naked, writhing bodies here (unless you count the goldfish). 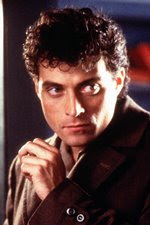 The cast is stellar: Rufus Sewell. 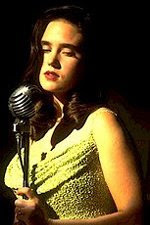 Jennifer Connelly. William Hurt. Kiefer Sutherland. DARK CITY is a prime example of what happens when the right actors with the right chemistry join forces to bring a story to life. 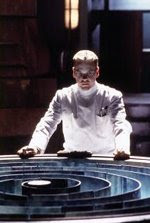 In particular, Dr. Daniel P. Shreber (Kiefer Sutherland) has a sensational character arc. 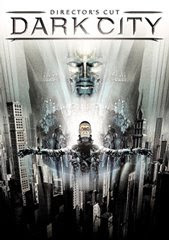 Although considered a disappointment at the box office, DARK CITY soon attracted a cult following on video. (I suspect the marketing department had a difficult time wrapping their minds around this one.) The video run was so successful in fact, that New Line recently released a new cut of the film to mark its 10-year anniversary. This release omits the ham-fisted “Here’s What’s Goin’ On, Ya Dummies” narration of the beginning, placed there at the behest of the studio. Cool trivia alert: Richard O’Brien, Riff Raff himself from THE ROCKY HORROR PICTURE SHOW, plays the lead baddie. His performance alone makes this film worth seeing. If you’d like to learn more, here’s a link to New Line’s official site. Film critic Roger Ebert was such a fan that he proclaimed it the best film of the year, and recorded an in-depth commentary for the DVD. Ebert unravels layer after layer of symbolism and points out the stylistic devices that went into creating a rich, sophisticated viewing experience. 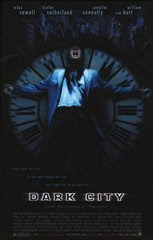 So if you’re feeling jaded and want to immerse yourself in completely new world, check out DARK CITY. That’s my pick for a fairly recent SF film done right. What’s yours? See you at Shell Beach (once you find the way)!